THE SHANNON MOSHER MEMORIAL FOUNDATION, INC. Become a bone marrow donor. 1-800-HELP-FLA (435-7352) THE SHANNON MOSHER MEMORIAL FOUNDATION, INC.
2. The initial annual combination blood and bone marrow/stem cell donor registration drive held in May, 2001 in Shannon’s memory, that registered far fewer donors to the National Marrow Donor Program (NMDP) registry than the initial goal I had set for the drive. There, of course, were some highlights from the events. For instance, because of my plan over the past several months to try and get the autographs of the current and previous 3 head coaches from both Georgia and Florida on their respective footballs, it provided the incentive necessary for me to obtain our current new website package that provides more flexibility and features than the original website design we had from as far back as when Shannon was battling the leukemia that eventually took her from us. I also met some very nice people during the process over the past several months and became familiar with other outlets in cyberspace that can be valuable tools in promoting different events in the future. In terms of expectations and based somewhat on input received from the sports memorabilia specialists who provided me with the ‘good faith estimate’ of value for each ball, $300, but also suggested that much higher bids could be anticipated from the respective alumni and fan base from each school, I actually thought there would be some avid Bulldog and Gator fans who would have perhaps offered up to $1,000 for each ball…a nice round number that would have enabled our Foundation to provide full financial assistance to 2 leukemia patients for a whole year. However, to honestly and humbly evaluate the overall project based on the number of man hours devoted to it compared to the results, it was definitely a dud! Perhaps the economy was a key factor; if not, the way I chose to market the footballs must have been a bit too optimistic. In any event, we still have the footballs and may well try another path to market them to raise some much needed funds to help other leukemia patients with their expenses. Well, when Shannon was battling leukemia and in desperate need of a matching bone marrow donor in early 2000, to even have a chance at an extended life, we held a drive at our church in Decatur, GA and had 420 new donors added to the National Marrow Donor Program (NMDP) registry. So, it seemed reasonable that 1,000 donors at Shannon’s mega-church in Duluth, GA (Perimeter Church) would be a good target goal to achieve at the initial annual bone marrow drive in her memory in May, 2001, a year after her death from leukemia and the effects of a less than perfect bone marrow match. In preparation for this initial drive, we received tremendous support from the co-hosts of the drive with our Foundation: the American Red Cross, the NMDP and Perimeter Church. We promoted the drive extensively in the community and Teresa and I even spoke at several Sunday morning classes at Perimeter the 2 or 3 weeks prior to the drive being held. A great amount of time, effort and emotional energy was expended into making this drive a huge success and, yet, we registered 42 new donors. While every new donor on the registry is important and appreciated, just from a numbers perspective based on the established goal, this too was a DUD! However, as related to both of the above events, I often recall what my dear mother used to say to me from time to time: “nothing ventured...nothing gained”. That’s my story and I’m sticking to it. The Auction: The above unique Georgia Bulldog football is being offered by The Shannon Mosher Memorial Foundation, Inc. (“Foundation”). The person with the highest bid over the Foundation’s good faith estimate of value of $300.00 (“Reserve Price”) for the football will become the proud owner of this football that has been autographed by past coaches Vince Dooley, Ray Goff, Jim Donnan and current coach, Mark Richt. 100% of the proceeds received by the Foundation for the sale of this football will go toward providing financial assistance to leukemia patients in the form of reimbursements for expenses not covered by their insurance. Our sincere hope is that the opinions of the independent sports memorabilia specialists who helped to establish the Reserve Price are accurate; i.e. that the auction of this unique football will result in a significantly higher amount being offered over the Reserve Price by an enthusiastic Georgia supporter, while giving the successful bidder a valuable keepsake that will be treasured for many years. See Auction Bidding Instructions Below. Full Disclosure: I had the privilege of playing for Coach Vince Dooley from 1964 – 1967 during his first four seasons at the University of Georgia. 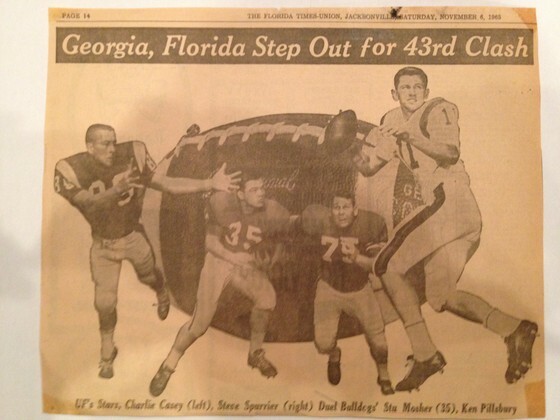 The newspaper picture below from the 43rd annual Georgia - Florida game on 11/6/65, shows yours truly (#35), along with teammate Ken Pillsbury and Florida's Steve Spurrier and Charlie Casey. Charity Auction/Tax Information: According to accounting information received by the Foundation, Donors who purchase items at a charity auction may claim a charitable contribution deduction for the excess of the purchase price paid for an item over its fair market value. For purposes of this auction and based on input from outside sports memorabilia specialists, the Foundation has set a good faith estimate of $300.00 for this Florida football autographed by the four coaches. Assuming the donor has no reason to doubt the accuracy of the published estimate, if he or she pays more than the published value, the difference between the amount paid and the published value may constitute a charitable contribution deduction. Consult your tax advisor for further clarification. During the past summer, I purchased this football and took it by the Athletic Department with a request that Coach Dooley and Coach Richt autograph it, so that, hopefully, after later getting Coach Goff and Coach Donnan to sign it, our Foundation would have success in auctioning/selling it to raise some much needed funds for use in our Patient Assistance program. Upon getting the signed ball from the Athletic Department, I did have the opportunity to meet with Coach Donnan at his home and Coach Goff at his office, and they both graciously agreed to also sign the football. The objective has always been to use this ball in a fundraising effort to help provide additional financial assistance to patients who are dealing with the horrendous effects of leukemia. Since the Foundation’s initial reimbursement check to the first leukemia patient we assisted over 10 years ago on 6/11/01, it has been our privilege to have been able to provide 43 leukemia patients a total of 179 financial grants totaling $37,316.75 through November 21, 2011. Whether or not you bid on the football, if you would like to provide financial support to the Foundation on a one-time or on-going basis, please either click on a PayPal button and proceed accordingly or, if you would prefer to donate via mail, make your check or money order payable to The Shannon Mosher Memorial Foundation, Inc. and send it to the Foundation at: 3589 Rock Elm Court, Auburn, GA 30011. A receipt will be provided for each donation received. NOTE: THE SHANNON MOSHER MEMORIAL FOUNDATION, INC. (REG. #13950) RECEIVES 100% OF EACH FINANCIAL CONTRIBUTION (THERE ARE NO PROFESSIONAL SOLICITORS OR FUNDRAISERS CONTRACTED BY THE FOUNDATION WHO RETAIN ANY PERCENTAGE OF THE CONTRIBUTIONS RECEIVED). A COPY OF THE OFFICIAL REGISTRATION AND FINANCIAL INFORMATION MAY BE OBTAINED FROM THE DIVISION OF CONSUMER SERVICES BY CALLING TOLL-FREE WITHIN THE STATE OF FLORIDA, 1-800-435-7352. REGISTRATION DOES NOT IMPLY ENDORSEMENT, APPROVAL OR RECOMMENDATION BY THE STATE. 1. Initial bids over the minimum Reserve Price of $300.00 will be accepted from late November, 2011 through midnight (E.S.T. ), Monday, December 12, 2011. 2. Bidder must be at least 21 years old, each bid should be sent to the following email address: stuartmosher@aol.com. 3. Bidder’s email should show on the Subject line: Georgia Football, and also include the bidder’s current dollar bid and the bidder's name, address, phone number(s), and best contact email address. 4. Assuming we experience no unforeseen website or other cyberspace issues, the Foundation will, at its sole discretion as to specific bids received, regularly update the highest bids received at the top of this link. 5. Soon after December 12th, the Foundation will notify up to the top 3 different bidders (and ties) via email, and they will have until midnight (E.S.T. ), Friday, December 16, 2011 to submit one final bid using the same procedure as above. NOTE: These bids will not be posted when received; i.e. only the highest winning bid will be posted and that will be done soon after the December 16th deadline. 6. In the unlikely event there is a tie at the December 16th deadline, a drawing will be held as soon as possible as follows: One of the adult leukemia patients (Donald) who lives in Carrollton, GA and for whom the Foundation has been providing financial support since 2005 (or a substitute should he not be available), will be asked to draw up to the 1st, 2nd and 3rd place winners from numbers assigned anonymously to any bidders involved in a final bid tie. C. Online, by using a PayPal button on the Foundation’s website (please add 2.2 % to the winning bid amount to cover the related PayPal charges to the Foundation). 2. After confirmation of payment received, the Foundation will make arrangements to ship the football to the high bidder to the property address provided, anywhere in the continental United States, via a tracking feature using either USPS Priority Mail or FedEx, unless a mutually agreed upon personal “hand-off” of the football is arranged between the winning bidder and the Foundation. 3. If the identified winner does not complete the transaction, for any reason including, but not limited to, the Foundation not receiving the payment in a timely manner as outlined in #1 above, the Foundation at its sole discretion will contact other high bidders in priority order until the transaction is complete.